The following blog post was written by the Columbia Heights Internship team: Shannon Van Dusartz, Mychayla Brown, Alejandra Diaz Torres, Modou Dibba, Salma Khalifs and Peyton Thao. Our mission at Spark-Y is to empower youth with hands-on education, so the emphasis during our Columbia Heights Summer School project was to engage the students with hands-on learning. Our intern group consists of four Columbia Heights 10th graders, who are experts on all things aquaponics—they built the aquaponics system that currently resides in the high school. The last intern is a senior at the College of Saint Benedict, whose expertise is definitely not in aquaponics; however, our all-star team taught each other new things and tackled the challenge of planning a summer school curriculum head-on. Our purpose was to plan eight days of content for a Spark-Y sponsored booster class for the Columbia Heights Encore Summer School Program. The first challenge was to think of ideas for the class as none of us had created curriculum before, and there was so much freedom to what we could plan. We thought about what Spark-Y has taught us during the development days and what Spark-Y teaches at other schools. We also wanted to utilize our diverse knowledge and experiences, and include those into our program. Finally, we decided on five themes with many activities in between: sustainability, aquaponics, gardening, fish, and nutrition. Selma and Alejandra took responsibility for the gardening, Modou and Peyton took charge during the fishing lessons, Shannon led the nutrition portion, and we all organized and led the aquaponics and sustainability lessons. To fill in the time, we did various activities like playing Ultimate Ninja or Mafia, and we even went outside into spectacular garden with Ms. Lemon. One of our bigger projects during the program was to design and build a new shed door with help from Andrew, and the students were more than willing to build something with power tools. We had great help from our Spark-Y advisers Lynn, Krista, and Cece to teach the students about the Five Keys of Professional Development and the Five E’s of Sustainability. Moving wood for the new shed door. Andrew, Spark-Y Systems Excellence Specialist helping the team on their shed door build. Our overall experiences share the same theme—we loved seeing the students learn and interact with new things. Here are some quotes from our intern group about our favorite parts of the experience and some challenging things as well. The following blog post was written by the Roosevelt Rain Garden Internship team: Zach Bigaoutte, Aidan Cuoco, Miguel Garcia, Amir Sheikhali, Sheila Sullivan, Hannah Wallace, and Davon Washington. 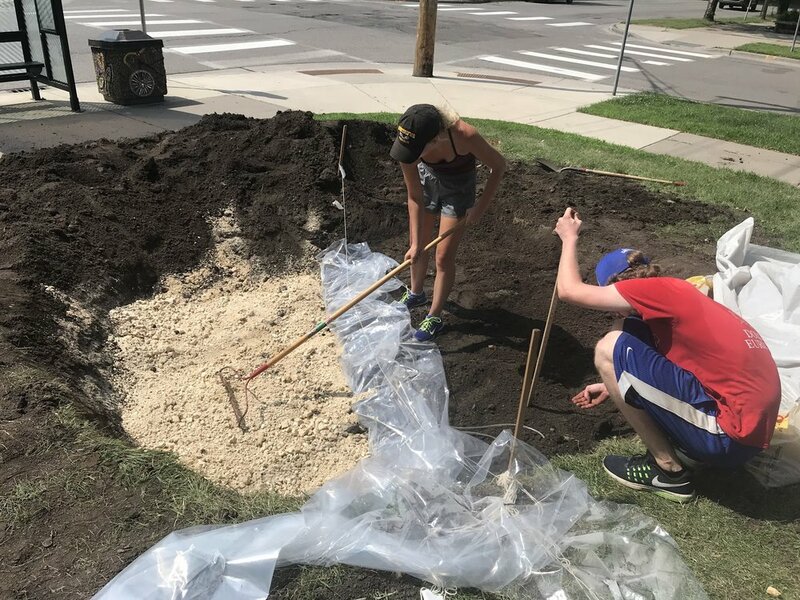 The goal of this internship team was to install a rain garden at Roosevelt High School as well as take care of the many sustainable systems present at the school. This project was funded in thanks to Hennepin County and RBC Wealth Management. One hot summer afternoon six Spark-Y interns embarked on a journey they would never forget. To start the summer these six Spark-Y interns began giving the Roosevelt Urban Farm the much needed love and attention it was so desperately craving, having been neglected since the end of the school year. Being the go-getters we are, we went headfirst into maintaining the farm, greenhouse, aquaponics, vermicompost, hydroponic, piano planter, and turtle planter. Roosevelt is one of the schools in the Twin Cities where the students are able to grow foods in the garden that are used in the cafeteria as a part of the Spark-Y curriculum in their urban farming class. As school is not in session, it was up to us to keep up the good work the students had done during the year. This included weeding the garden, watering the plants, training the bean and cucumber plants to latch to a trellis, and pruning the tomatoes. One of the biggest pests we dealt with was ridding the gardens of the Japanese beetles, a problem that is prevalent all over Minnesota. These shiny bronze bugs had to be picked off the plants and thrown into a bucket of soapy water to ensure they wouldn’t go back to munching on our produce or attract other beetles due to the pheromones they release on the plants as they eat them! We eventually found the bush where thousands of the bugs were living and went to town picking them off the leaves. To make it fun, we had a little competition amongst us to see who could hold the most beetles in one hand (Sheila won with 30). Along with all these tasks, we had to cut back the sun-artichokes, also known as Jerusalem artichokes. These are tuber plants, so if you try to pull it up and it rips, two more will sprout up, like the head of a Hydra! The sun artichokes had spread over all of the garden so we each took turns cutting them down, resulting in a better looking garden and many bug bites all over Aidan. If that wasn’t hard enough, we also decided to tackle building a rain garden. The goal of rain gardens are to filter out pollutants in water runoff. Rain gardens are built where there is natural irrigation and flow of water already, usually on a hill or slope. In urban settings, runoff is particularly toxic due to chemicals, infrastructure, and general city pollution. This runoff goes right into our drinking water and while we do have facilities to purify water, not every toxin can be eliminated. Rain gardens are a natural, beautiful, and environmentally friendly way to help this process. Another benefit is that we are able to bring in native, perennial plants from Minnesota that also able to provide ecosystem services and bring in pollinators to the garden. While the end result brings so many fantastic benefits, the work was not all sunshine and daisies. This quest started out day one of the internship. We had to call Gopher One, a utility contractor, to make sure the area we were going to excavate was clear of electrical wires and piping. We marked off the area with flags and the company inspected it before giving us the all clear to move ahead. After a heated debate over the true equation for area of a circle (or Zach just being bad at math), we were on our way. We started by taking all the sod off from the hole plot and disposing of it. Next comes the series of unfortunate events. For the slope of the area where the rain garden is, the depth has to be around six inches. So understandably, we dug the six inches. The next day we realized we actually had to dig out nine inches to account for the three inches of mulch we had to add in. At this point we had dug nine inches in total and began leveling it out. By some stroke of luck, we ended this day before putting the mulch in. This would have made our lives a lot more difficult in the long run because the next work day we realized we had to dig even deeper. A lot deeper. Two more feet to be exact! The additional depth was for research that one of the interns, Hannah, is conducting for the University of St. Thomas. The overview of the study is to compare water leachate of the rain garden between standard condition and a treatment consisting of drinking water residuals (drinking water residuals are a byproduct of water treatment that are found to reduce Phosphorus runoff). This required lysimeters that collect the water to be put in below the normal depth of a rain garden. So we got to digging accompanied by “Dig It”, the theme song for the movie Holes starring Shia Labeouf (fun fact: Shia Labeouf roughly translates to “The Holy Beef”, which we dubbed our groups own personal hashtag). Supplemented by popsicles and lots of water breaks, we dug out the additional feet. We installed the lysimeters and a plastic divider between the two conditions and began to fill the hole up. We got it to the nine inches, leveled it out, and celebrated that small victory. However, our work was far from over. The hole was filled in and thankfully, we got a long weekend break to relieve our sore hands, backs, arms…. Let’s just say our whole bodies! When we returned we had a few more tasks to complete before we planted the perennials. These jobs included: filling in the hole with mulch, building the berm (a barrier wall made out of dirt to make the lower edge of the rain garden the same height as the top side), and disposing the excess dirt. Filling the hole with mulch was quite easy, it took around 10 minutes to shovel it in and even it out. Building the berm was also not a difficult task as we already had a huge pile of dirt where the berm was to be located, so all we had to do was even it out and make it compact. However, disposing of all of the dirt we didn’t use was a difficult job! It took countless wheelbarrows and three full, giant containers full of dirt to clean up the area. This issue was compounded by the fact that one of the wheelbarrows had a flat tire, making the fifty pound loads even more physically exhausting to push! Luckily, we had zero wheelbarrow spills, like we had on previous work days by half our squad, which was an improvement for us. The dirt had been sitting in that area for around two weeks, with many rainfalls, so we had to rake, scrape, and brush the dirt for hours in an attempt to get as much of it off the grass as possible. Not to toot our own horns, but we did a pretty great job! The grass managed to stay relatively healthy, meaning we won’t have to re-plant it. All of this prep work has led up to the most important day for our internship: the volunteer tour. To help us finish up the rain garden we had a scheduled tour for volunteers to come help us in the farm and plant the rain garden. We had a group of 32 accountants from KPMG come to learn more about all of the cool sustainability features Roosevelt has to offer. We each spoke about a part of the work we have been doing at Roosevelt: Hannah did the intro, Davon showcased the aquaponics, Aidan talked about the vermicompost, Sheila explained the hydroponic, and Miguel and Amir tag-teamed the greenhouse, piano planter, turtle planter, and canoe garden. The accountants were really fascinated by everything we showed them and really seemed to enjoy the aquaponics. After the tour, we led them to the rain garden and as a group, gave them a little spiel about what a rain garden is, how it is environmentally friendly, and which plants we were going to be planting, along with a fun fact about each one (big bluestem grass, broadleaf arrowhead, lake sedge, sweet joe pye weed, prairie blazing star, sweet flag, black eyed susans, butterfly milkweed, marsh marigold, and northern blue flag iris). After this, we split the group into two. We sent half off to the farm to prune plants and do some beetle picking. The other half stayed at the rain garden and began planting. Each group spent 30 minutes at each site before switching. The accountants proved to be very hardworking, helpful, and kind people. We were very happy to get to share our experience with them and show them how special Spark-Y is to us, and to the local community. Because of them we achieved our goal of installing a beautiful rain garden at Roosevelt High School for people and pollinators to enjoy. We hope we “sparked” their interest in sustainability and how little acts of kindness through volunteering and treating the earth with respect can have a huge impact. The following blog post was written by 2018 Lube-Tech Internship Team: Isabelle Paulsen, Tarryn Michelson, Hamza Yusuf, Isaac Groven. Form and function are always battling; to get one you need to make concessions for the other. Many assume that sustainability is only associated with function, however, we are proving that sustainability can be equal parts of both. With the help of the Bame Foundation, our project is to build an aquaponics system in the Golden Valley office of Lube-Tech, a Minnesota based industrial lubrication distributor and recycler. But this is no ordinary aquaponics system. Our focus is to make this an aesthetically pleasing structure that belongs in an office, not just a functional garden. From the final design to the plants and fish that will grow in this system, we have had the opportunity to totally create a system we believe our client will love and spread Spark-Y’s vision of accessible sustainability. This is not a plain fish tank nor is it solely a structure to grow mass amounts of food; instead we are combining the two features to create a system where beauty and being environmentally-friendly coincide. As an avid Minnesota outdoorsman, Lube-Tech’s CEO Chris Bame hoped to have only native Minnesotan fish swim in this tank. We loved this idea so much we decided to use as many Minnesotan and locally-sourced species as we could. For our fish, we are housing large mouth bass and walleye, sourced from a local Forest Lake pet store. The rest of our 232 gallon tank will be filled with bluegill from our very own Spark-Y Urban Agriculture Lab. We want to give a special shout out to the Urban Ag Lab intern team that is helping make this transfer possible. For our plants, Minnesota native mint and watercress will be planted alongside basil, lettuce, arugula, and spinach. Sustainability starts with the community and buying or sourcing locally is a great way to make a difference. Minnesotan woodworker Brandon Anderson is turning this system into a work of art that will fit in any space. We are working together to make aquaponics accessible, that anyone who walks into Lube-Tech’s office will say: “Wow, how do I get this system?” It might not produce the most food, but it challenges the way we think about sustainability by turning food systems into something we want rather than just need. It is not just making sustainability functional but aesthetic too, from hobbyists to businesses around the community. Our small actions add up to make a big difference, but this system is also an example of how companies are taking steps towards sustainability and making large scale change. Overall this project has taught us that patience is key. We expected this project to be fast paced and finished quickly, however, we are 5 weeks into it and have hit roadbumps and been stalled. We aren't where we expected to be when we began the project, but we have adjusted and changed the plan. From email communications to waiting for seeds to grow, we are making adjustments. This project may be going slow, but the end product will be a visual representation of the world becoming more sustainable in new and creative ways. The following blog post was written by 2018 Northeast Sustainable Systems Team: Erin Boehme, Mike Salzl, Natalie Dusek, Andy Angel, Jahir Aquino & Gabe Cayetano. Our Northeast Sustainable Systems Team at Spark-Y is working with three public schools in the Northeast Minneapolis area: Pillsbury Elementary, Northeast Middle School, and Edison High School. Our main focus at these locations is to work on repairing and optimizing the current sustainable systems at these schools, which consist of aquaponic systems at all three locations, as well as a community garden at the Edison location. These systems are used to introduce the students to the topic of sustainability in an engaging, hands-on manner; to provide the student body with the ability to learn more about both science in general and the skills needed for growing and farming; and finally to supply fresh, nutritious food to the school cafeterias. Recycling is a concept near and dear to every environmentally conscious individual’s heart. But how is it used in the garden? We used recycling in two primary ways: composting and aquaponics. Composting is a way that we can take nutrients from unwanted or unneeded sources, such as weeds or dead leaves, and turn it into a treatment to better our soil. An aquaponics system also serves to recycle nutrients in an indoor environment. As the fish excrete Ammonium and Nitrate through their waste and gills, the plants uptake the nutrients and filter the water for the fish. It is important to remember that recycling is only one of the “Three R’s”: Reduce, Reuse, and Recycle. This phrase, repeated to us over and over again, seems to have lost its meaning. Many Americans focus almost solely on the recycling aspect of this mantra, when the practices of reducing and reusing are equally, if not more, important. All three are incredibly important when working towards sustainability in our nation, but it should be emphasized that these three actions are listed in order of focus. In other words, you should attempt to reduce the amount of materials you use as well as look to reuse those items, and only then recycle them once the former two paths have been exhausted. In addition to recycling, the Northeast Sustainable Systems Team has been able to effectively use the other two vital principles of reducing and reusing in aspects of all of our projects’ systems, with our main focus in these first few weeks on Edison High School. For example, when we first started working in the Edison High School garden we noticed that there were many items left by the previous year’s gardeners. These materials were then utilized to further support the garden’s structure and to aid plant growth, amongst other tasks. We have identified five main ways in which we reused the materials already present in our gardening space, thereby reducing the number of supplies we had to purchase and diverting useful items from the landfill. Rather than purchasing all of our plants from a garden store, we decided to bring some plants to our on-site locations from the Spark -Y headquarters, specifically from the Urban Agriculture Lab, or UAL. The UAL was almost overflowing with unused plants, and the Spark-Y staff were more than happy to unload some onto us. We then transferred our newly-acquired army of tomatoes, peppers, chives, and longevity spinach to the Edison High School aquaponics system and outdoor garden. After planting in the garden, we noticed some sheets of wire mesh which had been left on the outside of the fence. We decided to use this material to support the growth of our tomato plants. The wire mesh was bent into a circle and inserted into the soil around each tomato plant, allowing the stems to cling onto the wire and grow upward, rather than outward. This not only allowed the tomato plants to thrive, but also prevented them from spreading along the ground and overcrowding one another. While digging up one of the empty beds, we discovered several large rocks that had been hidden under the soil. What at first seemed to be only a few rocks later turned out to be a very large number, and we soon amassed a large collection. We elected to lay them out as a border for the garden’s gravel path, keeping the smaller rock gravel from moving into the open soil and vice versa. Not only did this have a practical use, but it also increased the overall visual appeal of the garden. After cleaning up some trash around the perimeter of the fence, we found a very odd bit of litter: a large piece of metal, shaped into the letter E. One side of the E was painted white, and therefore we have speculated that it had been a part of a sign once spelling “Edison.” More importantly, however, the other side of the structure made the perfect space to plant flowers. Thus, the giant letter was reused as a lovely planter for some yellow marigold flowers, representing one of Edison’s school colors. One of the plant varieties that we decided to grow in the garden were pea plants. These were placed around the inside edge of the fence and in some terraced, elevated planters. The seedlings by the fence would be able to wrap themselves around the slots in the fence, but the seedlings in the planters had no such support. In order to allow them to grow properly, we decided to stretch string down from an upper row of horizontal yarn. Then, taking some branches from a dead tree in our compost pile, we stuck some stakes into the planters’ soil and wrapped the string around them, pulling it taut enough to give support to the future pea tendrils. Gabriel Cayetano --- “I am a part-time vegetarian when I am at my mom’s house because she is vegetarian. We also have a compost bin that we use. I have also salvaged and reused computer parts that still function.